In 1736 AD, Nader Shah overthrew the last Safavid shah and established the country of Iran, with himself as the Shah (king) of Iran. Like Genghis Khan, Nader Shah was from a Turkish family. Apparently he and his mother were captured as slaves by the Uzbeks when he was a child. Like Genghis Khan, Nader Shah escaped and grew up to become a very energetic and successful general. So he always thought of himself as a second Genghis Khan. Nader Shah fought hard to get back a lot of the land that the Safavids had lost. He began his career as a general by pushing out an Afghan invasion and recapturing much of Afghanistan for Iran. Then in 1730, he attacked the Ottomans and got back most of Iraq from them. 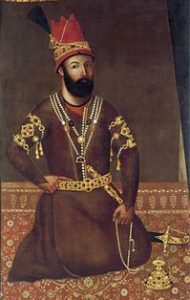 By 1743, with Nader Shah busy winning Pakistan back from the Mughal Empire, the Ottomans were able to coordinate their attacks with the Mughals and get Iraq back again. In 1747, assassins killed Nader Shah. After Nader Shah died, there was a lot of fighting over who should rule Iran. 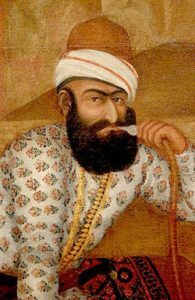 By 1760, the kingdom broke into two pieces, with Karim Khan – a Kurd, and so Turkish like Nader Shah – ruling Iran, while Ahmad Shah Durrani started the country of Afghanistan. 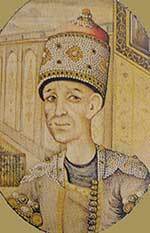 Karim Khan was a great ruler, who brought peace and riches to Iran during his reign. He opened up a relationship with Britain, and the East India Company began to trade with Iran. But when Karim Khan died in 1779, there was another civil war. Iran grew poorer, partly because William Pitt in Britain started cotton plantations in Africa that took away business from Iran. Cite this page: Carr, K.E. Nader Shah – history of Iran – the 1700s. Quatr.us Study Guides, September 11, 2017. Web. April 21, 2019.